Have some holiday loot that's buring a hole in your pocket? 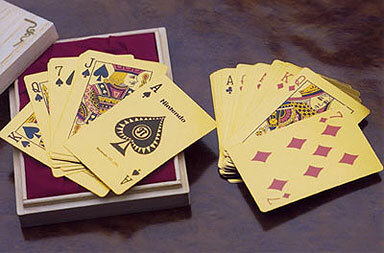 Why not pick up some real gold having playing cards that are branded with the Nintendo Seal. 0.73g of pure gold is used in each card so the price may bounce a little if the cost of gold does but for now you can pick them up (in Nagoya Japan that is) for only a little more than $3,600.